These days, as traditional as Christmas pudding, is the transition from sentimental Christmas adverts to January sales promotions. I’m delighted that Scholastic approached me for two reasons – firstly in their capacity as a publishing group, as they have produced a great title for reluctant readers, and also because they have started their amazing sale with up to 88% discounts on fabulous children’s books (from a variety of publishers). 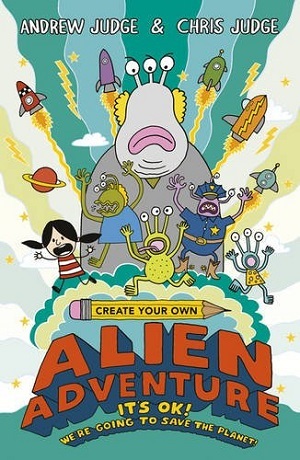 Create Your Own Alien Adventure: It’s OK! We’re going to save the planet! By Andrew Judge and Chris Judge is an adventure story in which the reader both fills in the gaps (literally, with a pencil and colouring crayons), and also chooses the twists the story will take by turning to the page of their choice. Building on those classic ‘choose your own adventure’ stories, this title goes further because the reader is invited to draw on the book. With Daisy, the heroine, the reader tracks an invading alien back to his crashed space ship and adventures with him into space. Except that by doing so, the reader has inadvertently led the alien army to Earth, and now the reader must protect it – with Daisy and some characters (of the reader’s own inventing). Not only is it truly interactive (the reader is also invited to tear certain pages), but it’s a great tool for reluctant readers to conquer a book, read a story, follow instructions, and participate in a story arc. Chris Judge is an award-winning picture book illustrator (Tin, The Lonely Beast, and most recently The Snow Beast), and is joined by his brother Andrew. The illustrations are simple so that a young reader doesn’t feel intimidated by them. The language too is simple, but humorous, with plenty of eye-catching typeface changes, enlargements etc, to keep anyone interested, as well as some great dialogue. I’ve already shown the title to two parents of reluctant readers who were both eager to obtain a copy of their own. Luckily for them, this title, retailing at £5.99, is in the Scholastic January Sale for £2.99, and you can buy it here, and it will be followed in April by a further title in the series, Create Your Own Spy Mission. If tempted by the TV showings of David Walliams children’s book entertainment, you can buy his new title, Grandpa’s Great Escape, in the sale at £8.99, as well as some Early Reader Horrid Henry’s including Christmas Play at £2.99. Scholastic are also great at selling packs, and this non-fiction one caught my eye – narrative non-fiction so that you learn as you read a story – I Survived pack of five books at £9.99. What’s more every order over £10 earns 20% back in FREE BOOKS for a school or nursery of your choosing. For this reason, I am directing you to the sale site here, rather than my usual referral site.